As we transition to the latter part of the year, it’s time to take stock of how the IEEE Industry Standards and Technology Organization (ISTO) team is doing in its support of the Federation members. To make that assessment, beginning in mid-October, a select group of ISTO program stakeholders will be invited to participate in the 2016 Program Satisfaction Survey. ISTO has commissioned McKinley Advisors Inc., an independent marketing research firm, to conduct this survey. You will receive an email concerning the survey on or about 12 October. Please complete the questionnaire as soon as you possibly can. It will take you approximately 15 minutes or less to complete. Respondents will be entered into a drawing for one of two iPad Minis. Please take the time to complete and submit your survey so that ISTO can continue to monitor the needs of our constituents and continually improve itself for your continued satisfaction. If you don’t tell us where you see opportunities for improvement, we can’t make them happen! Your feedback is highly valued by the ISTO Board of Directors and the whole ISTO team! Take a minute and complete the survey the day you receive the email. Thanks! ISTO supports a wide range of industry technologies. OpenPOWER Foundation has advanced the HPC industry through data center innovations by enabling custom POWER CPU processors and system platforms. Watch the video below to learn more about OpenPOWER Foundation. The Fairhair Alliance and the OpenAIS Project have signed a liaison agreement to exchange and discuss use case requirements and high-level architecture approaches, with the objective of creating a common architecture solution for lighting and building automation to enable the 'Internet of Things' in buildings. Fairhair will share its technical objectives, data model structure, security model and device and service discovery, while OpenAIS will share its requirements and architecture deliverables. streetlight systems within one single Central Management Software, has initiated a program to expand its scope on setting standards to manage other Smart City and IoT (internet of things) applications. Following the demand from cities, software suppliers and hardware manufacturers globally, a new Smart City ‘Requirements Workgroup’ was set up to extend the TALQ specification to support IoT interfaces for cities. This decision will broaden the reach of the consortium for new member companies, including those not from the lighting industry. The MIPI®Alliance, an international organization that develops interface specifications for mobile and mobile-influenced industries, today introduced MIPI Touch℠, a forthcoming specification that leverages current and new MIPI specifications to provide an innovative, comprehensive touch interface. MIPI Alliance invites industry participation in the development of the touch specification. The organization made the announcement during MIPI DevCon2016, its developer conference held this week. MIPI Alliance is developing MIPI Touch to optimize the integration and performance of touch technologies in mobile phones, tablets, automotive dashboards and infotainment displays, and other devices and applications. Synopsys, Inc. recently announced extensions to its open-source licensed Interconnect Technology Format (ITF), which enables additional modeling of complex parasitic effects between device structures and interconnect layers at the advanced 10-nanometer (nm) and 7-nm process nodes. These new models will enable parasitic extraction tools to accurately capture silicon variation that impacts timing and reliability analysis. Synopsys collaborated with members of the Interconnect Modeling Technical Advisory Board (IMTAB), an ISTO Federation Member Program, to refine and ratify these new extensions. They are available in the Synopsys ITF version 2016 through an open-source license. For Starbucks customers who don’t already have a Qi-enabled smartphone, they can add it to their phones simply by using the Fluxy – a Qi receiver in the form of a small chip or case (Note: There are hundreds of Qi-equipped smartphone cases and accessories available today for purchase online and at retailers). In addition, external adapters – the Fluxy Drop Universals – can be borrowed directly at the Starbucks coffee houses where the FluxPorts are installed. 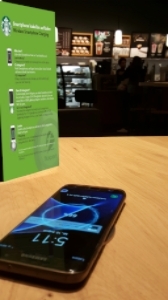 FluxPort has been successful installing Qi wireless charging spots in a number of other locations, such as the New York Bar & Grill Berlin, Mall of Berlin and the Hyatt Berlin. Peter Lefkin, managing director of MIPI Alliance, shares his thoughts on the benefits of working with the IEEE Industry Standards and Technology Organization (ISTO) ... from day-to-day program support, to the unique synergies with IEEE.